This page covers network simulation software.It mentions satellite simulator basics,satellite delay simulator and its application notes. The hardware device or software application which simulates satellite conditions in a controlled environment is known as satellite simulator. The one whuch introduces satellite network delay or latency is known as satellite delay simulator. Various companies are developing it in order to support different variety of satellites such as GPS, Galileo, Geo-synchronous, Iridium etc. Following application note describes GPSG-1000 portable satellite simulator from Aeroflex. Figure-1 depicts touchscreen satellite simulator. It is truly portableand easy to use Galileo and GPS position simulator. It can simulate 3D point in time. It is available in 6 channel and 12 channel configurations. Following are the silent features of Aeroflex satellite simulator model GPSG-1000. • Can simulate GPS and Galileo signals. Following table mentions satellite simulator hardware and software vendors. Moreover Rohde & Schwarz has introduced GNSS simulator in their VSG series SMBV100A aimed to perform GNSS receiver tests. It is useful for mobile phone manufacturers having systems with GNSS modules. 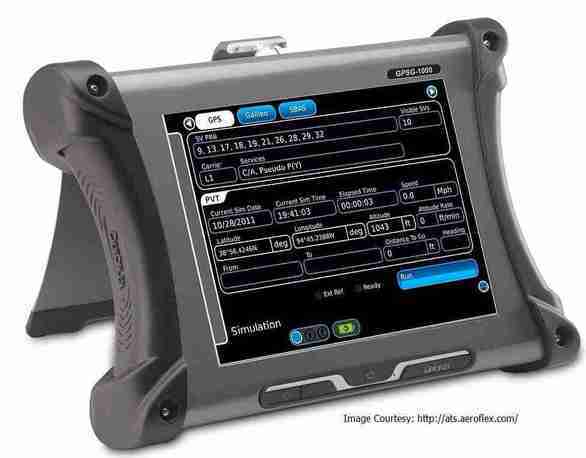 Keysight technologies has also recently introduced 50GHz firefox handheld analyzer to perform testing of complex satellite systems.